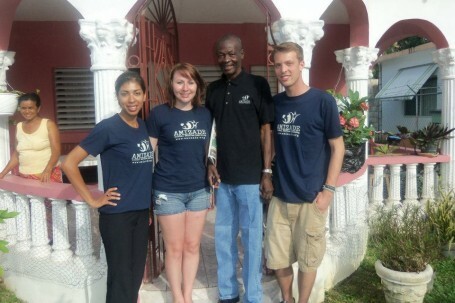 Last month we shared with you Cassandra’s experience as a member of the special delegation of Amizade interns that visited our partner community of Petersfield, Jamaica in honor of a special visit by Jamaica’s Governor General to the rural community. Today, Grace shares her experience. On Monday May 7th I made the drive from Slippery Rock University to Pittsburgh, using my day off before my final exams to meet the other new interns and the staff at Amizade. The orientation went as planned; we learned the ins and outs of the organization in preparation for our summer internships. I was excited already – I couldn’t wait to get my hands dirty and start learning more and more about Amizade. 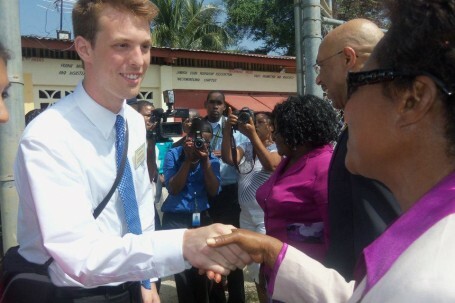 Then over lunch, Brandon, our Executive Director, mentioned that the Governor General of Jamaica would be visiting Petersfield, Amizade’s partnering community in rural Jamaica on Wednesday, May 16th. The Jamaican site director, Mr. Matthias Brown, would love an Amizade representative to go but none of the staff members were available. Just casually inquiring, would any of the new interns like to go? The first words out of my mouth were, is this real life? Five final exams and six days later Cassandra, Aaron, and I were on a plane to Montego Bay as the new intern representatives of Amizade. I wasn’t sure what to expect – in all the craziness of the end of the school year I hadn’t researched the community nearly as much as I’d wanted to. We had a crash course on the Petersfield community and the importance of Amizade’s partnership there. We knew to look for Mr. Brown at the airport and that everything else was taken care of; be flexible and willing to learn was my mantra during our journey. We were greeted with the warmest of welcomes by Mr. Brown and promptly continued our journey, making the one hour drive to the rural community of Petersfield. My eyes stayed glued to the windows as we pulled into the town: beautiful colors, trees, and flowers – goats, cows, and chickens grazing along the road – and people everywhere! Walking to work, walking to school, selling mangos and breadfruit along the streets and socializing with each other on the Sunday afternoon. We went straight to the community center, headquarters of the Association of Clubs, where the house mothers of the community greeted us with open arms. After just the first day in Petersfield we were a part of a welcome dinner and Mother’s Day celebration, I knew this week was going to be full of fantastic experiences. Over the next two days, I began to realize what the Governor General’s visit to Petersfield meant to the community. The Most Honorable Sir Patrick Linton Allen and his wife Lady Allen were travelling around Jamaica and visiting notable communities as a celebration of Jamaica’s 50th anniversary. Petersfield was chosen due to its outstanding community organizations, increased tourism, and overall improvement during this time. I came to understand that this was the equivalent of the president visiting my small hometown of Apollo, PA. So this meant excitement was high! We helped the community prepare for the visit by painting and sprucing up the park and reorganizing the community center. Other members mowed the grass, swept the streets, and hung signs of welcome announcing the big visit. Somehow in the two days of frantic preparation, Mr. Brown and the other community members still made time to show us around the community and to the local Bluefields Beach and Roaring River. We swam in the crystal clear water and explored a cave in the hillside. Each evening we went back to our housemothers’ homes for a meal – fresh fruits, rice, chicken and pork – delicious! Then Wednesday was the big day – community members took a day off of work and children and high school students were out of school. Everyone wore their finest dresses and suits and awaited the 10am arrival of Sir Allen. We all lined up – ready to shake hands and take pictures. His helicopter landed in the community park’s field and as children waved their flags and the cameras flashed, Sir Allen waved to the crowd awaiting him. His visit was truly a celebration of everything that is great about Petersfield. Members of the Association of Clubs, students, and residents of Jamaica spoke to Sir Allen about the areas of development the community center focuses on, including sports, culture, computer skills, videography, village tourism and more. When it was time to talk about Amizade’s impact on village tourism, Mr. Brown hurriedly asked me if I could speak – I couldn’t say no! So I was placed in front of the crowd of proud Petersfield residents, government officials, and the Governor General himself to talk briefly about why Petersfield is so important and why the partnership we have is so special. From here, all of the attendees including each of us were lead to the park for a celebration and ceremony, full of speeches, performances, and of course the ceremonial planting of a tree. Each group that visits the park plants a tree at their departure – and Sir Allen’s visit was no different. of the delicious food, rich culture, and growing economy. Petersfield is special because the sense of community is so powerful and because of the true love and trust that exists amongst the residents. Each and every person we met welcomed us with open arms – into their homes, into their community center – and made us feel as if we were supposed to be there. We weren’t tourists or visitors. In that week, we were members of the community just like each of them.